There’s not a lot to go on here, just a few contradictory verses from four different books. There’s a one-verse story from 2 Samuel saying that David got a name for himself by killing 18,000 Syrians in the valley of salt. Then there’s a (sort of) similar verse from 1 Chronicles that agrees with 2 Samuel on the number killed (18,000) and the site of the killing (the valley of salt), but disagrees about the identities of the killer (Abishai vs. David) and the people killed (Syrians vs. Edomites). And there’s a Psalm story that says it was Joab who killed 12,000 in the valley of salt with the candlestick (or was it the lead pipe?). And God approved of everything David ever did (with the single exception of the matter of Uriah). There’s something else we are told about this killing. After the 18,000 (or 12,000) Edomites (or Syrians) were killed in the valley of salt by David (or Abishai or Joab), Joab killed every male in Edom. So how many were killed in this killing? 18,000 or 12,000 in the valley of salt? And how many males were killed in Edom in Joab’s male genocide? I’ll take 15,000 (the average of 12,000 and 18,000) for the number of Edomite (or Syrian) soldiers that were killed, and guess that 50,000 males of all ages were slaughtered, for a total of 65,000 in all. The 700 / 7000 horsemen thing in my last post reminded me of this fun NonStampCollector video. Here are links to the contradictions mentioned in the video. How long does God's anger last? Is salvation by faith alone? Does Yahweh delight in burnt offerings? Is God the author of evil? According to Genesis, were humans created before the animals? On the road to Damascus, did Paul's traveling companions hear the voice that spoke to Paul? Will the earth last forever? Is Jesus the only man to have ascended into heaven? In Old Testament Law, were children to be punished for the sins of their fathers? Does God ever get tired? How many valiant men drew the sword for Israel as counted by Joab? How many horsemen did David take ? How much did David pay for the threshing floor? How many men did the chief of David's captains kill? When are two thieves one thief? How many blind men did Jesus heal near Jericho? How many women came to the tomb? Whom did the women see at the tomb? Are riches a curse or a blessing? Did the temple curtain rip before or after Jesus died? Who put the gorgeous purple robe on Jesus, Herod's soldiers or Pilate's soldiers? Did Jesus curse the fig tree before or after driving the merchants from the temple? Should homosexuals be killed or exiled? Given that Quirinius became governor of Syria nine years after king Herod's death, was Jesus born during the reign of King Herod or the governorship of Quirinius? When the women arrived at the tomb of Jesus, was the tomb opened or closed? Did Judas die by hanging himself or by falling over in a field and having his guts fall out? Is God the author of confusion? As I mentioned in the last killing, God approved all of David’s killings (except for the matter of Uriah). He even helped out with most of them. Still, some of the ones from 2 Samuel 8-10 are just too damned boring to deal with separately, so I’m going to lump them together here. 2 Samuel 8 begins by telling us that David somehow found some more Philistines to smite. David hamstrung ("houghed" in the KJV) all but 100 of the 1000 horses. And another 47,000 Syrians (or was it 40,700?). So I'll give David (and God) credit for 66,850: 1000 Philistines and 65,850 Syrians. (22,000 in the first killing and 43,850 in the second, taking the average of 47,000 and 40,070 from the stories in 2 Samuel 10 and 1 Chronicles 19. After Saul’s death, David became king of Judah and Saul’s son, Ishbosheth, king of Israel. Things didn’t go well for poor Ishbosheth, though. First his father and brothers were killed by God. Then his captain, Abner, was killed by David’s captain, Joel. And his army was always fighting a losing battle with David’s. He was about ready to call it quits. After Abner died, Rechab and Baanah became Ishbosheth’s captains. One day Rechab and Baanah went to visit Ishbosheth, who was taking a nap at the time. They pretended to be picking up some wheat, but they really stopped by to kill him. And they “smote him under the fifth rib” (the preferred place to smite someone in the Bible). After smiting him, they cut off his head and took it to David. They figured David would be pleased, since he and Ishbosheth were enemies. But they were wrong. David told them about how he killed the Amalekite who killed Saul, even though Saul asked him to since he was mortally wounded. Now he was going to kill them for killing Saul’s son, Ishbosheth. So David had his “young men” kill Rechab and Baanah, cut off their hands and feet, and hang their bodies up over the pool in Hebron. Mutilated bodies hanging over pools make such nice decorations! Here's one that I forgot to add to God's list. It's about two of God's favorite people: Abraham and Lot. God gave Abraham (God called him "Abram" back then) pretty much everything on earth, as far as he could see. Lot had lots of stuff, too – too much stuff, in fact, to keep it all separate from Abraham’s. So Lot decided to move to Sodom. Soon after Lot got settled in Sodom, a war broke out between the kingdoms of Sodom and Gomorrah and some of the other local kingdoms. The Sodomites were defeated and Lot was taken prisoner. That’s when Abraham got involved. He and 318 of his slaves took off after the anti-Sodomites. And they “smote” the heck out of them, chasing them all the way to Damascus. Abraham brought back Lot, the women, and the Sodomite stuff. When Abraham returned “from the slaughter,” the king of Sodom went out to greet him, along with Melchizedek, “the priest of the most high God,” who brought some bread and wine. And Melchizedek thanked God for helping Abraham slaughter the anti-Sodomites. Then Abraham gave Melchizedek a tenth of all the stuff he got in the slaughter. A nice fee for such a puny prayer. How should we treat prisoners of war? Fortunately, as with so many difficult questions, the Bible has the answer! Bible believers don't need to worry about the Geneva Convention. God tells them directly what to do with their POWs in the Bible. All they have to do is follow David's example. That is the Bible's infallible answer. * How do we know this is right in the eyes of the Lord? Because the Bible tells us so. Chris Trumbull of Casper, Wyoming has painted a sign on his fence with a verse from the Bible. Here's what it looks like. This is a verse that believer's never quote -- not even Fred Phelps, Steven Anderson, or Doug Wilson. It's as though it had been removed from the Bible. But it hasn't. Mr. Trumbull's interpretation is a bit weak, though. Leviticus 20:13 doesn't say: "To be gay = death." It says, "Kill homosexuals." And not even Chris Trumbull is willing to say that. It's time for believers to remove the verse that they cannot say out loud -- or just throw the whole damn Bible away. The Lord knoweth how to ... reserve the unjust unto the day of judgment to be punished: But chiefly them that ... despise government. These ... speak evil of the things that they understand not. They ... count it pleasure to riot in the day time. Spots they are and blemishes, sporting themselves with their own deceivings. But then, some people interpret this passage differently. If believers want to know what God thinks is right, they should look at the life of David. He is the gold standard of biblical morality. How do we know that that? Because it says so in the Bible. Everything David did "was right in the eyes of the Lord," except for one thing: "the matter of Uriah." So as long as we stay away from the Uriah affair, we can be absolutely certain that we are doing right in the eyes of the Lord whenever we follow David. And since there are so many stories about David in the Bible, we can derive an infallible, Bible-based morality from them. That is what God wants us to do. That's why he put those stories in the Bible. Here are some of the things that we know are "right in the eyes of the Lord." It's OK to kill people. As long as your killing is similar to one of David's, you can be sure that it's perfectly moral and that God will bless it. But before you start, check the context of David's killings to make sure that yours is OK with God. Here is a list of 22 killings that David either performed himself or had other people do for him. God approved of every one of them. He even helped out on many. It should be easy to find one to serve as a model for the killing that you have in mind. See how easy that was? It makes you feel sorry for all those atheists who have to actually think about what is right and wrong, doesn't it? Here is the list that I put together based on your ratings. Thanks for your help! It's hard to keep track of Bible characters. They often have the same name, live at the same time, do pretty much the same things (are evil in the sight of the Lord), and have the same fate (God usually kills them). It will drive you nuts if you're not careful. Take king Ahaziah, for example. First of all, there were two of them: Ahaziah of Israel and Ahaziah of Judah. They lived at about the same time (9th century BCE), were evil in the sight of the Lord, and they were both (more of less) killed by God. I've already told you about Ahaziah of Israel. He was the guy that God killed for asking the wrong god if he would die after God burned to death 102 messengers for asking Elijah to come down from his hill so that Ahaziah could ask Elijah to ask God if he was going to die (even though he'd already been told God was going to kill him for asking the wrong god). But this story is not about him. It's about the other Ahaziah, king Ahaziah of Judah. There are a couple things to keep in mind about him. 1. Ahaziah of Judah had an alias: Jehoahaz (2 Chronicles 21:17, 25:23). 2. And he is the only person in the Bible (or anywhere else as far as I know) who was older than his own father. Here's how we know that. Ahaziah of Judah began to reign when he was 42 years old after God killed his father Jehoram (by making his bowels fall out). And his father's bowels fell out (with a little help from God) when he was 40 years old. Okay, but how did Ahaziah of Judah die? For that we have to go back to the Jehu chronicles. You remember Jehu, don't you? The guy who madly drove around in his chariot killing people for God? Yeah, well, Ahaziah was on his list. But Ahaziah was with Jehoram at the time and was pursued and wounded by Jehu. Ahaziah fled to Megiddo and died there. Since I couldn't tell from this story whether or not Ahaziah died from the wound or later from natural causes, I left it off the list of God's killings. But then I read the story in 2 Chronicles. According to this story, Jehu killed Ahaziah while he was hiding out in Samaria. "And the destruction of Ahaziah was of God." So I don't know who to believe. Did Ahaziah die in Meggido or in Samaria? I'm not sure. But I'm going to stick my neck out here and say that God approved of his killing, however and wherever he might have died. For "the destruction of Ahaziah was of God." After Jephthah finished killing and burning his daughter for God (51) to pay God back for helping him slaughter twenty Ammonite cities (50), he ran into some Ephraimites who were angry about being left out of the Ammonite slaughter. They were so pissed off about the whole thing that they threatened to burn down Jephthah’s house. Jephthah claimed that he invited them to join him in the God-assisted slaughter, but they didn’t come. Clearly, there was only one thing for Jephthah to do: call for a holy civil war. So that’s what he did, and the men from Gilead defeated the Ephraimites. After the battle, Jephthah posted guards at the Jordan River where the fleeing Ephraimites would have to cross. Then when the Ephraimite mispronounced Shibboleth by saying Sibboleth, they’d kill him. And the Shibboleth test worked like a charm. 42,000 Ephraimites failed the test and were killed trying to cross the Jordan. And they deserved it, too, for not participating in the slaughter of the Ammonites, threatening to burn down Jephthah's house, failing to pronounce "Shibboleth" correctly, or whatever. 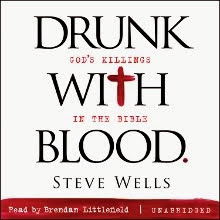 I've already posted about some of the killings (see links in the table), and I'll be adding more later to explain how we know that God approved of these killings. Eventually, I'll combine the lists to show all of God's killings, those that he approved of and those that he did himself.